INT, FIN & EST CH, BH LECIBSIN MARK WELLSSON "Make"
The best first dog I could have ever had " Thank you Jukka for trusting me to have this gorgeus and sweet boy! I'll always love Make, he's my best friend. 1 x res-cc from Russia. 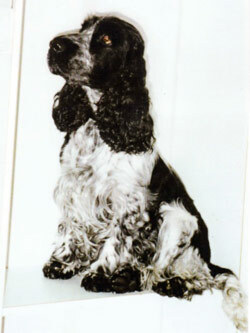 3 x CACIB, 3 x RES-CACIB, many BOBs, BIS-2, BIG-2 BIG-3 , many BOB-VET, BIS2-VET, BIS4-VET BIS-VET & 3rd best dog in our annual cocker speciality 2005. 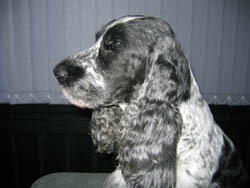 BIS-2-VET and numerous best dog placements. Many bob-vet placements. 2x BOB-VET and BIS-VET from Romania. 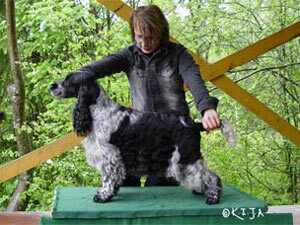 THE MOST OBEDIENT SPANIEL IN FINLAND 2000, THE WINNER OF THE SPANIELS' FINNISH CHAMPIONSHIPS 2000. 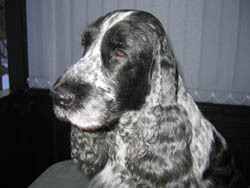 THE COCKER OF THE YEAR #6 in 2006! THE BEST VETERAN AND THE 2ND BEST PARTICOLOUR IN 2006!! Judge Lisbet Campbell wrote to his critics on the 5th of Nov.2005 in Tarto Estonia: "A grand old man. If all old men would be like this one the human world would be very nice to be in. 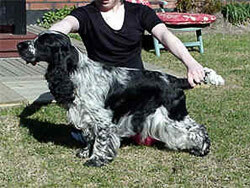 A very nice spaniel!" 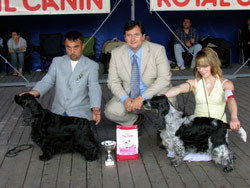 The result was BIS-2-VET & 2nd best dog. 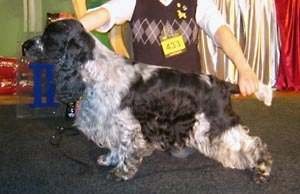 Make lost only to my NordJW-05 Rancecraig Scottish Gent who was BOB and BIG-2! "You are the universe, and there ain't nothing you can't do. 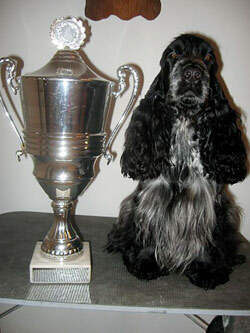 that's why I believe in You, oh yes I do"
The Finnish Spaniel Association's Veteran of The Year 2007 award. 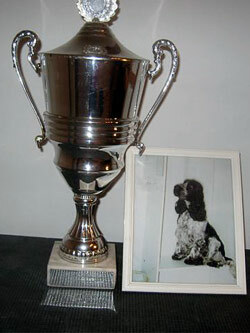 Make unfortunately passed away before we had a chance to take a picture of him with his trophy. 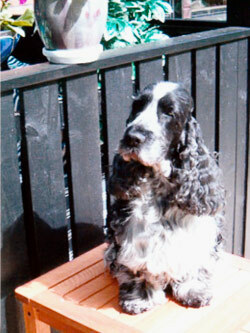 Jenny posed instead to honor with great pride the legacy of the sweet granddad. 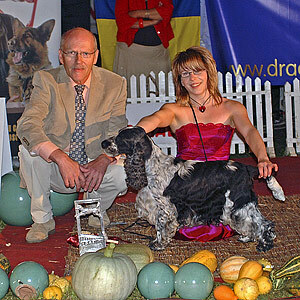 Make bos-vet in Romania 2007.